We have entered into a partnership with the North York Moors National Park Authority (NYMNPA) to carry out work at Skerry Hall to ensure the future of our woodland and to plant new hedgerows and reinforce an existing gappy one. The woodland is an important feature in the coastal landscape around Robin Hood’s Bay, as well as providing a habitat for a wide range of wildlife. The new hedgerows will define an ancient boundary that was as long ago as 1853 marked as ‘defaced’ on the Ordnance Survey map, as well as providing cover and nesting sites for many birds and acting as ‘wildlife corridors’. Over the past two weeks the North Team of apprentices from NYMNPA have been erecting double fencing in two of our fields to protect the new hedgerows when they are planted in the coming months. 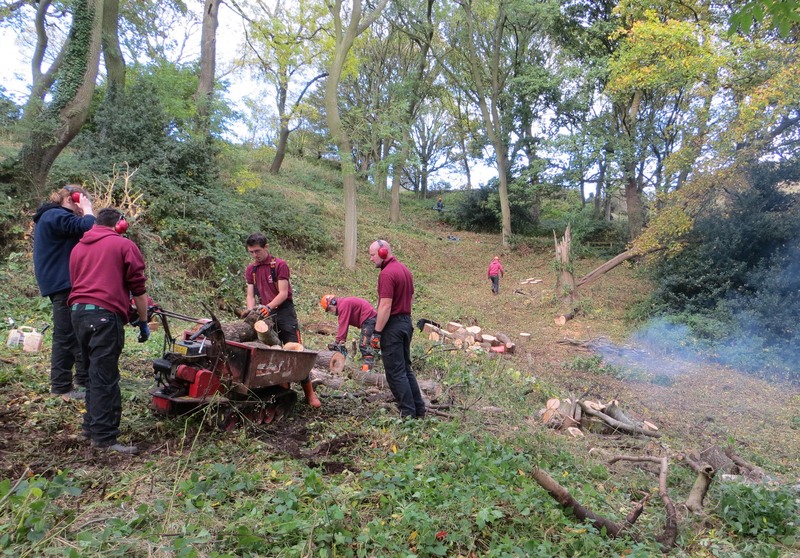 This week they have been clearing brambles and fallen trees in our woodland in advance of planting mixed hardwoods during the dormant season this winter. We have lost two mature ash trees as a result of strong winds over the past two years alone, and others have shed large boughs, adding to the losses in previous years. Care has been taken to leave dead branches on many of the trees and some timber on the ground to provide a mixed habitat for fungi, insects, birds, small mammals, and the species that feed on them. We would hate to lose our owls, woodpeckers etc.! The works build upon those carried out last year, when the footpath through Skerry Hall Farm was improved by the same team. Why not visit Skerry Hall Farm for yourself and see why we are so passionate about the place where we live?